One of the most distinctive features of QC-CALC is its ability to automatically collect data from so many machines without user intervention. Often the hardest part of SPC is acquiring the data from your inspection equipment in a format you can use. We often meet customers who have been spending time cutting and pasting or typing the data into Excel only to turn around and import it back into their SPC software. All of this manual effort wastes time and money. 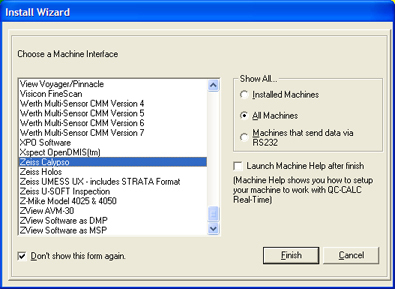 QC-CALC is the only SPC software on the market with such a complete ability to acquire data from the equipment. How do we do it? Over the years, we have formed relationships with all of the major equipment manufacturers and built their formats into QC-CALC. As the formats change, we continue to add new drivers to the collection. This means QC-CALC natively understands the machine formats without you having to develop your own parsers. We continue to add new drivers almost weekly and a full list of our currently supported machines can be viewed at the link below. If you don't see your machine on the list, it may just be that nobody has requested it yet. Email us at support@prolinksoftware.com and in most cases we'll add it without charge. Under almost all circumstances, the only thing that needs to be done in QC-CALC is to choose the measurement equipment (shown on right) from which you want to collect data. From there, QC-CALC automatically knows the file format and the path where the machine will drop its stats output file. As soon as you measure parts, you'll see plots. See our Automatic Database Creation section for more details. The only thing we can't control is the myriad of machine software. To help you with this, each machine contains step-by-step instructions and screen shots on how to get the stats data out of your specific measurement equipment. In addition, there are usually extra features we add to the drivers to allow you to control QC-CALC's behavior directly from the machine.